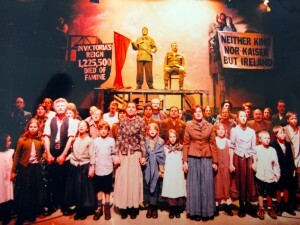 The life and death of the revolutionary figure James Connolly provides the story for this play. Rather than concentrate solely on the macro-politics of the Irish situation, the play looks at the personal, everyday life of Connolly looking at his family, his relationships with those around him, his art, his gradually failing health and his imprisonment. Throughout the piece the somewhat problematic relationship between nationalism and socialism is explored – what is the point of fighting for Irish independence when a majority of the population would remain in extreme poverty regardless of whether British or Irish politicians were in charge? Irish history has been of particular interest to Robert with plays such as Portadown Blues (2000). “AT the beginning of this big, powerful community show, the band strikes up with a plaintive twirl of traditional Irish pipe music; and out in the audience, half of us instantly think of the soundtrack of the film Titanic. It’s a moment that comes as a sharp reminder of how the story of Ireland’s struggle has been abused by both its friends and its enemies in recent years; sentimentalised in Hollywood, demonised in the British tabloids, and simplified beyond any semblance of truth. So it’s good to report that Jimmy C! 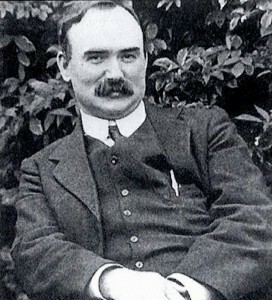 – scripted by Robert Rae for a cast of no fewer than 50 – takes some magnificent steps towards understanding the complexity of one of the great leaders of Ireland’s struggle, the Edinburgh-born James Connolly. There is a fine re-creation of a demonstration organised for Queen Victoria’s Diamond Jubilee in 1898, complete with re-enactment of the 1798 United Irishmen rebellion by a team of a dozen children; a splendid evocation of a Belfast women’s strike in the early 1900s; and a brilliant closing sequence that sends shivers down the spine.